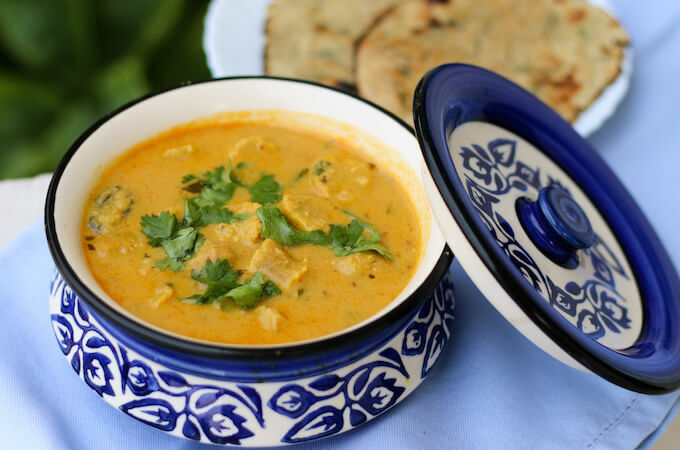 Gatte ki sabzi is a lip-smacking, traditional Rajasthani dish. Gatte are steamed gram flour dumplings cooked in a spicy yogurt and gram flour gravy. In this recipe, the gatte (dumplings) are very soft as only fresh cream and yogurt is used to make the gram flour dough. Adding water makes them a little hard. I am from Jaipur and have fond memories of smearing all my fingers while trying to scoop the gatte curry with roti :-). If you ever visit Jaipur or any other city in Rajasthan, you must try the authentic Gatte ki sabzi. Sabzi is the generic hindi word for a vegetable dish. There isn’t really any “vegetable” in this sabzi except for some tomatoes. But that also explains the origins of the dish in Rajasthan. Being a desert state, local fresh vegetables were rare and so Rajasthani cuisine developed a lot of dish that used grains and dals and other non-perishables like this papad ki sabzi. So I wished for gatte ki sabzi. The sabzi could have easily cooked in the background while I did whatever I do at my parent’s home, but this time I wanted to learn my mother’s gatte ki sabzi recipe. I am planning a big Diwali dinner when I get back to Bucharest and I really want to include traditional Rajasthani dishes as we are the only ones from Rajasthan in the Indian community there. Learning never stops and never from your first teacher! So this is recipe from my first teacher — of everything — my first word, my first step, my first dish. Don’t get surprised by the long list of ingredients. They are mainly spices. Just keep your spice box handy and you will see the recipe is very simple to follow. Hope you like this authentic Rajasthani Gatte ki sabzi recipe. Please do take a moment to rate the recipe below and/or leave your comments after the post. It will really encourage me. Gatte ki sabzi is a traditional Rajasthani dish. Gatte are very soft steamed gram flour dumplings cooked in a spicy yogurt and gram flour gravy. Enjoy it with millet breads like bajra roti, jowar roti or rice. Mix together all ingredients to get a soft dough like a chappati dough. Add more yogurt if required to get a soft dough. Do not add any water. Water makes the gatte hard. Rub some oil on your palms. Divide the dough into equal parts and roll them into 1” thick cylinders, about 3”-4” long each. In a microwave of cooktop steamer, steam the gatte for 5-7 minutes. Remove from heat and carefully open the steamer. 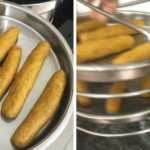 Cut and check one of the gram flour cylinders. If it cuts easily, means they are steamed through. Once cooled, cut them into rounds of ½“ thickness. Keep aside. In a bowl, whisk together yogurt, gram flour, turmeric, red chilli powder, salt, ginger paste and chilli paste. Add 1 cup water. Mix well and sieve through a big strainer to ensure there are no lumps. Heat oil in a kadhai/wok. Once the oil is hot, add cumin seeds, curry leaves, cloves and black cardamom. Sauté for a minute. Add the yogurt mixture and stir continuously till there is a boil. Add the tomato purée (should be very smooth), mix well and again bring to boil. Reduce heat to low. Add the steamed gatte, cover and let the gravy simmer for 5 mins. Add more water if the gravy is very thick. 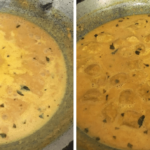 This is a no onion-no garlic Gatta curry recipe, but you can also add onion and garlic paste while making the gravy. 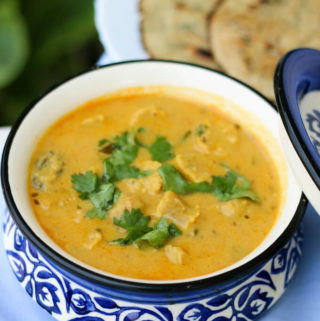 A tasty variation to this traditional besan ke gatte is paneer gatte. Just add ½ cup grated fresh paneer to the gram flour mixture to make the gatta dough. I really hope you try this recipe for a taste of my state in your plate. It will surely wow your guests during this festive dinner season! I’d never heard of gatte ki sabzi before, but this looks and sounds amazing – I’m going to have to add this to my list! This is a very special recipe from the desert state Rajasthan in India. Definitely give it a try and let me know if you have any questions. i have never heard of this recipe but it does sound really comforting and delicious! It is a very traditional recipe from India but all the ingredients are easily available at most places now. It really is delicious and you should definitely try it if you want some Indian which is different from the regular tikka masalas and curries. Those sound delicious! I am from Panama and I found it hard to make tamales here with no easy to find steamers in the USA. My husband poked some holes in a couple throw-away aluminum pie pans for my tamales recipe and it works great! You drop the tins in a large pasta pot with a little water and steam away! I need to try your recipe and steaming some gatte now! Since we move countries every two years and we reach before our shipment, I have to manage with a very basic setup for almost 2-3 months while we wait for the shipment to arrive and that is when we get the most creative! I truly believe less is more! These days there are gadgets for everything while most cooking tasks can be done by normal kitchen tools! Thank you so much for your share and rating! Oh my I love Gatte ki sabzi and you are right I only ever ate it once in Jaipur when I visited there. They told me had to try this and the dalh so I did and I loved it. This looks awesome. Thank you so much for your feedback and rating! Really soul warming dish. The amount of spices never scared me from trying new delicious recipes! It looks fantastic ! 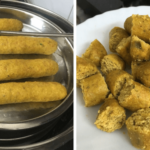 I like the chickpea (gram) flour dumplings! I need to try that – I’m looking for more ways to use that flour. I love dumplings in just about any form and with these flavors I know I’ll love this. well it looks great.I will definitely try this recipe. Thanks for this wonderful dish.